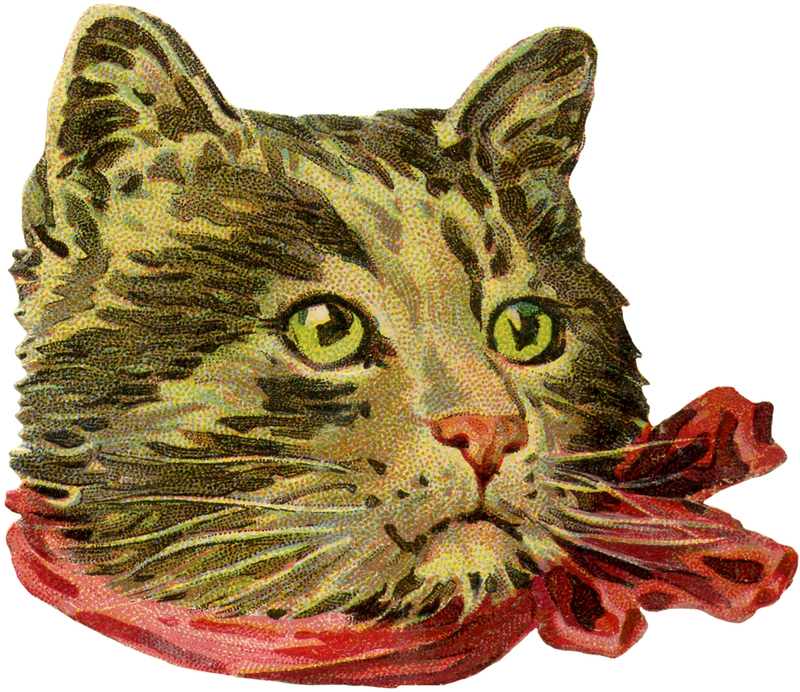 This is a cute collection of Vintage Cat Images. 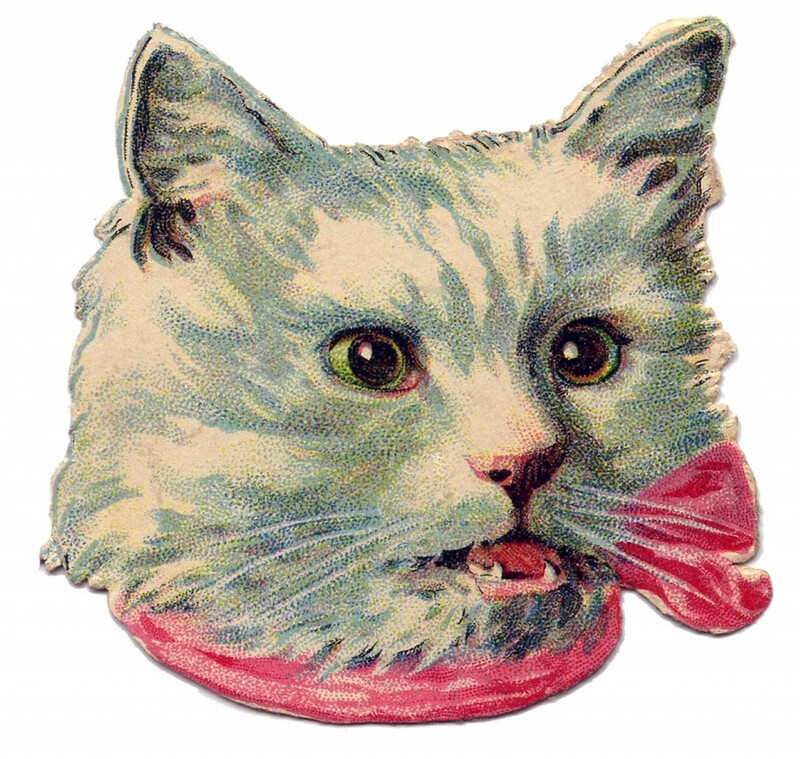 These are all High Resolution Images, included here are 6 Victorian Die Cut Scraps of Kitty Cats! There are several Tabby cats in the mix, as well as a couple of solid color Cat Images in Black and White. These were all scanned from my collection and would have been originally used by Victorian Ladies over a 100 years ago, to glue into their Scrap Books. These are so much fun to collect and work well for Collage or Mixed Media projects, or any type of Crafts where you just want to add a bit of furry cuteness! 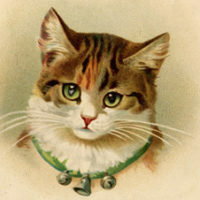 This is a very cute Vintage Cat Image! This little kitty appears to be an Orange Tabby Cat. He has got Orange and White fur and big blue eyes. This is an old Victorian Scrap Die Cut Piece. He reminds me of Morris the Cat, do you guys remember him? Here we have another Sweet Tabby Cat Image. This one has bright Green Eyes and Gray and White Fur. She has a darling little pink nose and a dear little smile. 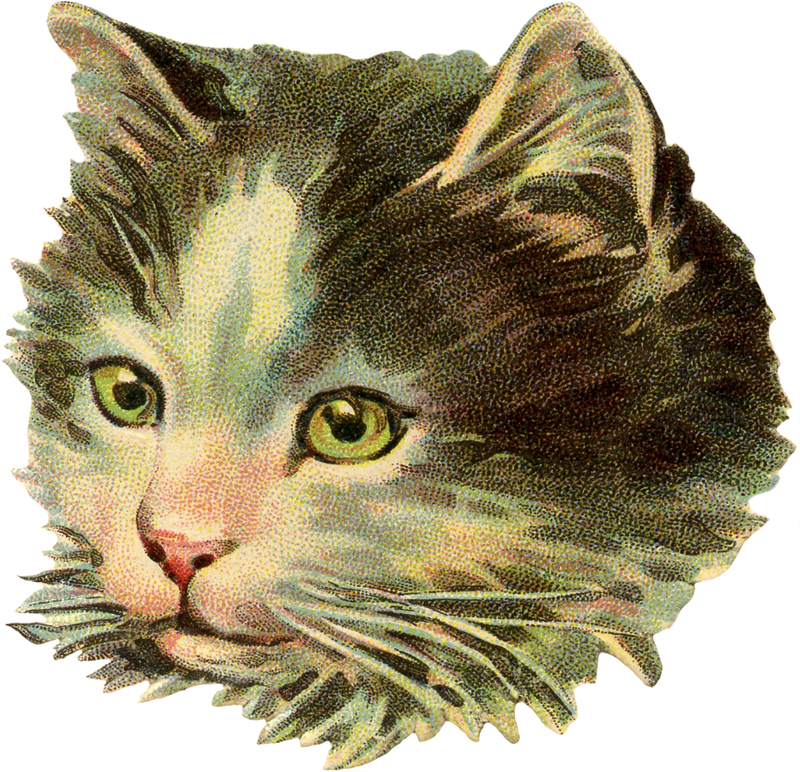 Here’s a cute Vintage Scrap Image of a pretty White Kitty Cat! She’s got Green eyes and a big Pink Bow around her neck. Her mouth is open, as if she is meowing. Perhaps she wants a treat! 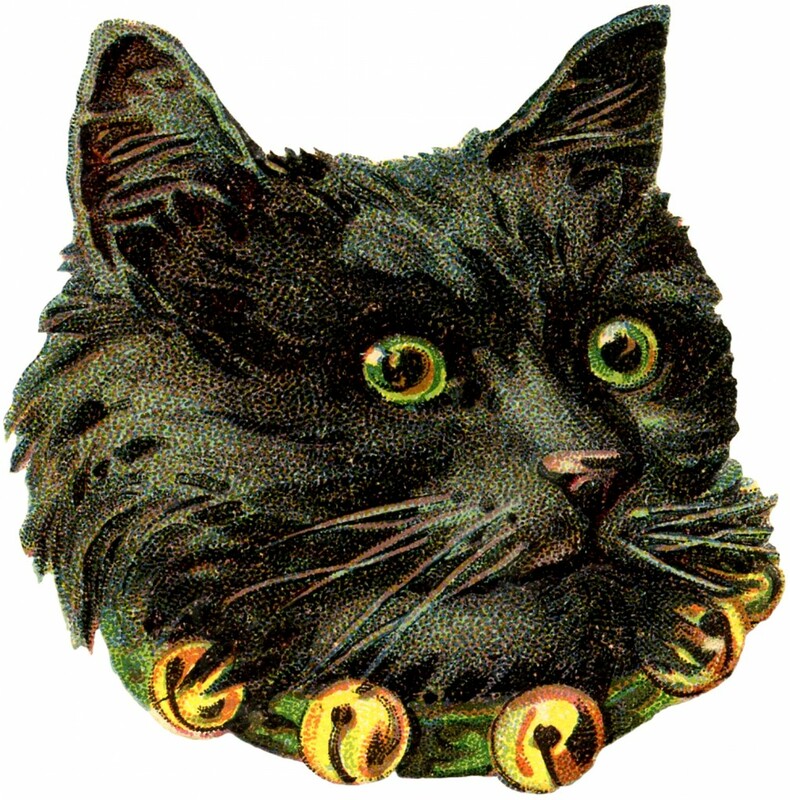 Here’s a wonderful Free Black Cat Image. I think this one might be my favorite! I love his bright green eyes next to his fluffy black fur. Around his neck he’s wearing a bright green collar studded with little Jingle Bells! The collar matches his eyes perfectly. He would be a great one to use for your Halloween projects. In fact you can find a tutorial for a cute Halloween Jewelry Project using this image HERE. This is a cute vintage Cat Picture! This sweet little Kitty is wearing a salmon colored bow around his, or perhaps it’s a her, neck. This cutie has green eyes and tabby striped markings on her fur. And here we have one more! Just look at the sweet face on this kitty scrap! 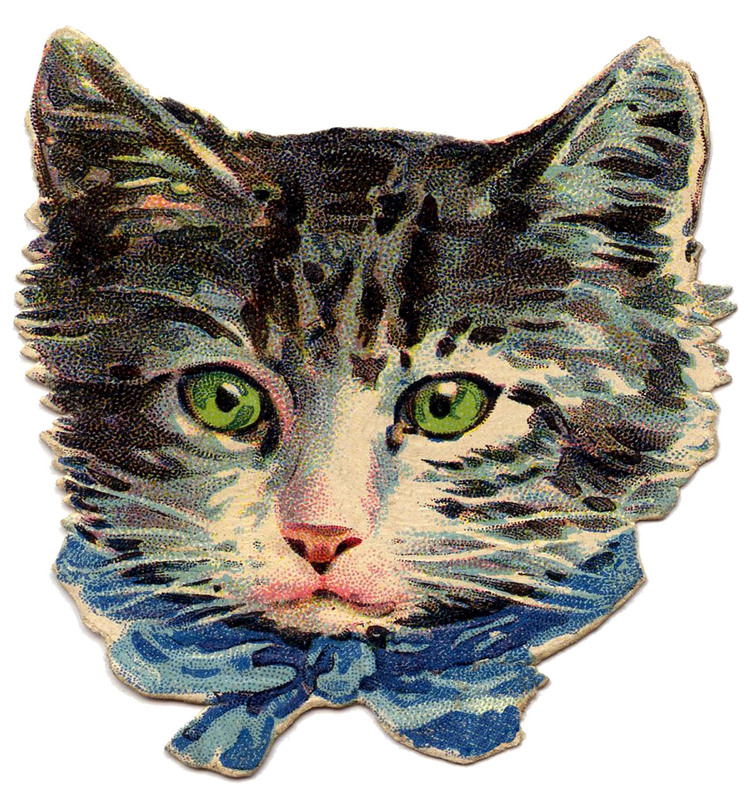 This gray and white tabby has the brightest green eyes and a lovely bright blue bow around his neck. 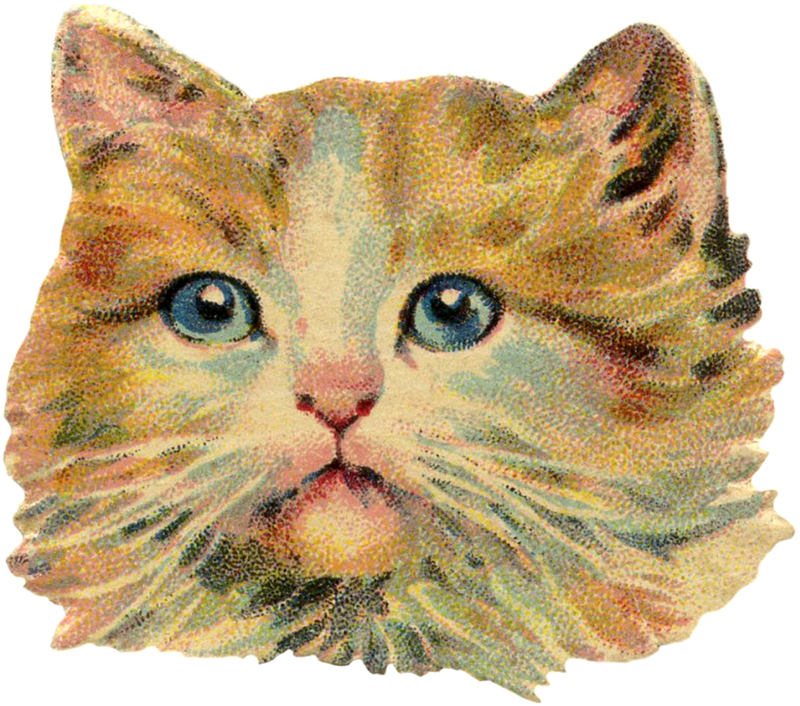 I hope you enjoyed this collection of cute Vintage Kitty Cat Images. The originals are all die cut, which means they were cut out around the outline. 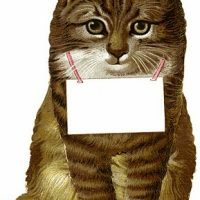 When you print these out, they will be on a white background, so they will require a bit of fussy cutting if you want to remove the white around the cats heads for your projects, like decoupage or collage, or if you want to use these as a digital stamp. For other projects like Card Making etc, you might find that the white background works just fine for you. 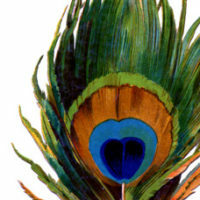 You might also like our Best Vintage Animal Images post HERE. I used your halloween tags to top my stacking pumpkin! They were perfect! Lovely kitties – thank you!